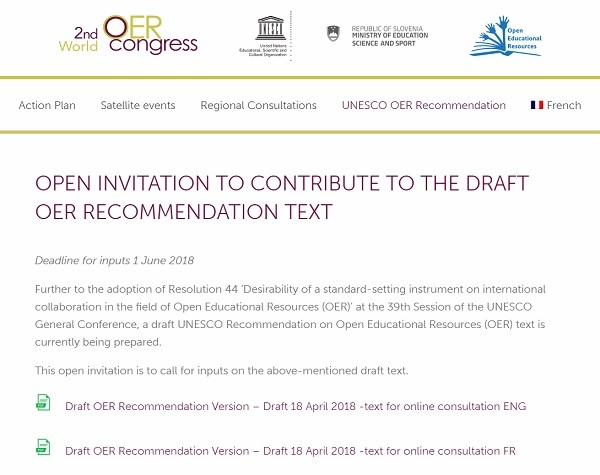 UNESCO is drafting an Open Educational Resources (OER) Recommendation. This is an official UNESCO instrument that will both advise national governments on how to support open education in their countries and report on those efforts. The draft Recommendation text has been prepared by a group of open education experts from UNESCO, researchers and practitioners from all world regions. The OER Recommendation builds on the Ljubljana OER Action Plan, a product of the 2nd World OER Congress, 18-20 September 2017. Open Educational Resources (OERs) are teaching, learning and research materials in any medium – digital or otherwise – that reside in the public domain or have been released under an open license that permits no-cost access, use, adaptation and redistribution by others with no or limited restrictions. Open Educational Resources (OER) are teaching, learning and research materials in any medium (text, digital or other formats) that reside in the public domain or have been released under a [standard, interoperable (not custom)] open license that permits no-cost access, use, adaptation and redistribution by others. The online consultation process is now open and you can contribute to the draft. The deadline for submission of contributions is: 1 June, 2018. In addition to providing your own comments, please share this opportunity through your networks. Applications due April 24, 2018 !!! OpenStax at Rice University is excited to announce the next round of applications for our Open Educational Resource Institutional Partnership Program, designed to provide you with advice and guidance to greatly increase the use of OER on your campus and create a networking community for support and advice. Open Educators Factory is a methodology produced by the Research Institute for Innovation & Technology in Education (UNIR iTED) aiming to allow self-evaluation of professors capacity in the use of open approaches and to recommend tailored actions to increase the open education “fluency" of educators. The platform will be used by Brazil's Open Education Initiative, a major Brazilian project focused on Open Education and teacher professional development. The Cognitive Tutor Authoring Tools for course development, environments for computer supported collaborative learning, natural language dialog, semi-automated coding of verbal data, and LearnSphere for storage of student interaction data analysis of student knowledge and performance. To keep up-to-date with AIMS news, please, Sign up for AIMS Newsletter; keep up to date via our Twitter feed at @AIMS_Community. And, thanks again for your interest !